Hey, how’ve you been? As I surge ahead with Merchantry, it’s getting so much better. Merchantry: Fixed the ObjectAnimation states' Initialize action not being called. Merchantry: Changed WorldObject's UseObject() method to LeftClick() and RightClick(). Merchantry: Added a basic character class, which all characters (PCs and NPCs) will derive from. Merchantry: AI now makes use of priority checking (as a float). The highest priority goal is the current goal. I’ve got the foundation for crafting in place! It’s very functional, just need to do a little bit of polishing. While I hoped to use Aeta UI for this interface, I ended up coding some new classes just for game world UIs (Element, ButtonElement, ImageElement, ItemSlot). All world UIs derive from UIObject, which then derives from WorldObject. Let me walk you through how crafting in Merchantry works. Pictured above is the crafting table, as viewed from the perspective of the player (ignore the doggos). Clicking on the crafting table will zoom up really close, allowing you to use it properly. The UI is intentionally positioned on the right-side of the screen to make room for the inventory, which opens up on the left. Currently, the crafting table has similarities to how Minecraft handles it. Drag your items onto the grid, and if the item placement matches a recipe, the red “X” changes to a hammer. Clicking the button will create the item(s), placing it into the output slots below. Now you can grab the items and put it into your inventory. Nice job! One important distinction is that the UIObject contains its data, so walking away (exiting) from the UI won’t force the items out like in Minecraft. I’ve placed items in it, exited out, and starting pushing the table around. I really enjoy how connected this UI feels to its world. Even though its used for crafting, I can easily create different UIs. An anvil for reinforcing/repairing tools and armor, a furnace for smelting ores and baking food, etc. All I need is the object’s texture, position the elements, and set up recipes to match the slots. Nothing too fancy or much to say about it, but it gets the job done. Each object has it’s own ObjectChat class. This is where all of the important chat data comes from. While you can send a string directly, the best way is to add a a string with a key. The key is called, and a random message is sent. Fairly helpful! In Merchantry, AI is goal-oriented, making use of a float for priority. The highest priority goal is focused on first. In this example, the dog has two goals: Follow, and Rejoice. Follow’s priority is calculated by the distance from the player, and Rejoice’s priority is at a fixed value. If the player moves too far from the doggo, he’ll move towards the player. When he reaches the player, he celebrates by jumping and barking. I may need to make some tweaks in the future, but it works well. Current Goals: Polish existing features, various world textures, object selection code, character code, pathfinding code. Future Goals: Pause UI (simple overlay), escape key UI, message UI, dialogue UI, professions. Hello, how are you? So, I’m doing something a little different… just this once. All changes related to Merchantry will be placed under the Merchantry section, and likewise for Aeta UI. Merchantry: Completely changed how the inventory data is handled. Much more reliable! Merchantry: Renamed ItemObject's "Attributes" to "Enchants". Merchantry: Added "Attributes" to ItemObject, meta data for characters and other situations. Merchantry: Added an advanced tooltip UI. The inventory uses this very well! Merchantry: Added EnchantAssets.cs and ItemAssets.cs. These contain items and enchantments for copying. Merchantry: Fixed an issue with ItemObject's RandomID not using a properly seeded Random, thus ruining everything. Merchantry: Fixed a mistake that caused the consumables and resources tabs to be interlinked. Merchantry: Items can now be dragged out of the inventory. 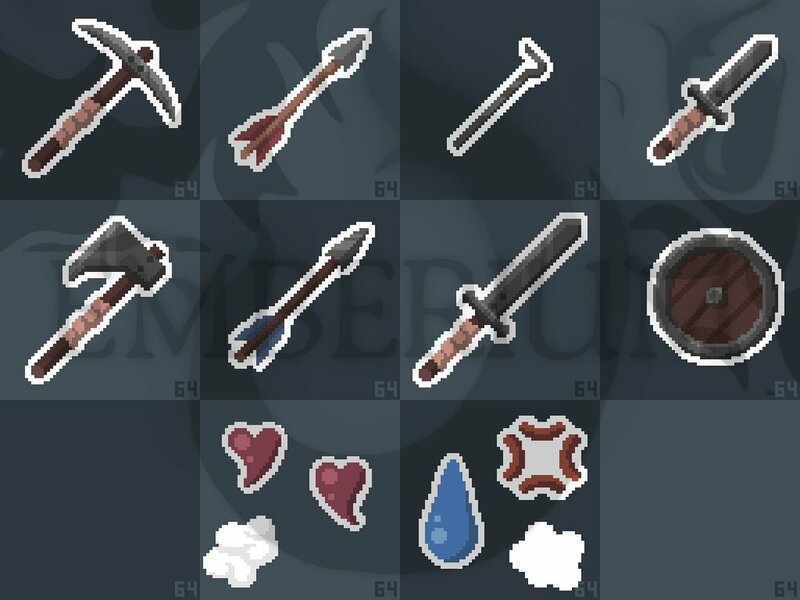 Merchantry: Added icons to the tabs [2/5]. Merchantry: Fixed a lot of issues with the current font. Much nicer! Since release, I’ve made a large number of improvements to the Aeta UI library. I was very happy with how useful this library was on release, and with more improvements and fixes I get happier. I won’t list all of the changes since version 1.0 here, but I will soon. Anyway, here’s the reason why Aeta has it’s own section. When I’ve got a bit more of the library worked out, I’ll post Aeta 1.1 in the next week or two. Aeta UI: The size of an interface can now be easily changed through SetSize() or setting Size directly. Aeta UI: To keep elements from jittering, some vectors have been converted from floats to integers. Aeta UI: Elements now use their UI's ActionQueue rather than creating their own. Less memory usage, and more reliable when modifying the element's dictionary. Aeta UI: Improved the method for keeping user interfaces inside the screen. Aeta UI: Renamed variables in Camera.cs: LookAt() to Focus(), ForceLookAt() to ForceFocus(), DelaySpeed to MoveSpeed, WorldToScreen() to ToScreen(), ScreenToWorld to ToWorld(), Zoom* to Scale*. Aeta UI: Improved how the Camera's scale interpolation is handled. It now behaves very similar to movement. Aeta UI: Added another dimension to the Camera's scale, allowing vertical and horizontal stretching. More freedom! Aeta UI: Removed the parallax vector parameter in Camera's View() method. Aeta UI: Improved the Camera's IsOnScreen() method. Aeta UI: Fixed a critical error inside a method that checked if the mouse was inside any maximized UIs. Caused by an invalid conversion. Current Goals: Crafting UI, game world textures and code, character art style. Monument: Mailing works... again. If you sent me an email through Monument in the past few months, I did not receive it. I apologize for the inconvenience. Monument: Updated the links in the about page from Enckling to Emberium. Monument: Changed my avatar, added the new Emberium logo, and changed "Latest Posts" to "Emberium". Monument: Opening a non-exe download now goes to the expected folder. Monument: Buttons are now properly positioned after loading the library. Monument: Posts on the About screen are functioning again, now loading from a text files rather than Squarespace. More work, but more flexibility. Aeta UI: Added StretchBoxElement. For images that need to stretch without losing corner quality. The improved About page in Monument. To all of my Patrons, I’ve released an update for Monument which fixes a lot of bugs, replaces previously broken features, and some nifty stuff on the About screen. To not break from the typical post format, I’ve listed all the minor changes in the section above. When launching Monument online, it should auto-update. If it does not, you can download it from here. If there are other issues, please let me know. So, what the heck have I been doing on this project these past few weeks? I’ve taken a break from item icons, done some UI asset design, and focused more on coding the foundation of the game. First, I’d like to show off some more of the icons I made earlier. They’ve got an fairly awesome style! Above, you’ll see (mostly) iron tools. A pickaxe, wooden arrow, lockpick, dagger, axe (or hatchet), iron arrow, longsword, and round shield. The other stuff were particle effects I was experimenting with. The other images is foods I was experimenting with. The great part of this style is it’s so much more efficient, and still looks great. In Pilgrimage of Embers, I put a lot of detail into my icons, which meant most icons took between 30 to 60 minutes each. In this new project, each icon uses between 3 and 7 colors, and take between 10 to 15 minutes each. Since we’re still talking about art, here are some of the UI assets! Similar to the icons, the interface textures have a simple but effective look. 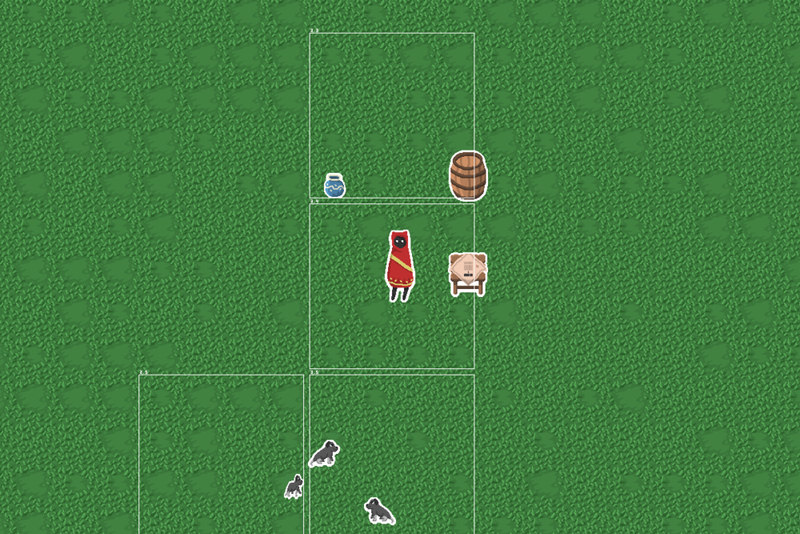 With a timber and rope theme, it goes well in a game about crafting and trading. Camera. It’s fairly smooth, and works well. I may need to add some additional details. Calendar. An incremental system, primarily used for scheduling game events. Scaling and rotation. The “formula” that decides how it scales and rotates can be easily replaced (lerp, smooth lerp, loose, etc). ObjectStats. Level, experience, and professions. Partially complete. ObjectMemory. Short and long term. Useful for characters. ObjectAnimation. A short and powerful class for full control over a texture’s animation. ObjectStorage. A class used by WorldObjects to hold items. It is used directly by the inventory UI. Basic meta. ID (string, not int), name, description, texture icon, quantity, worth, tab (enum). Attributes. Keywords that modify item worth. “Damaged”, “Cursed”, “Flame Enchant”, etc. Quality. An enum value as either low, medium, or high. Boosts item worth. Efficient stacking. Items are added to a Dictionary with ID plus stats (quality, attributes, etc) as its key. This makes it really easy for the game to decide if the item being added can merge into an old stack (increase quantity) or needs a new one. Base UI. A simple class that has some of the standard features set up, such as the border, title bar, background texture, and masking. All other UIs should derive from this class. Inventory UI. See video above. Currently re-writing parts of it, but coming along well. Current Goals: Inventory UI, character art style. Future Goals: Crafting UI, Pause UI (simple overlay), Escape Key UI. Simple character textures (pre-alpha), game world textures.